The 2012 lincoln mkz electric vehicle qualifies for a federal tax credit of up to $7,500, effectively reducing the net base price. The mid-size 2012 Lincoln MKZ sedan shares its platform with its corporate sibling the Ford Fusion, and they are both coming due for a freshening. However, that doesn't detract from the Lincoln MKZ's reliable service history, class-leading efficiency with the Hybrid model and reasonable transaction prices within its category. That category, however, is a moving target. GM, with the Cadillac CTS and Buick LaCrosse and Regal, and Chrysler, with the 300, have been updating their entries. But, for now, the MKZ represents a mid-size luxury car with a good record of reliability and decent efficiency, and at a not-extravagant price. If you're looking for a mid-size, middle-class, medium-priced sedan with trappings of luxury, then the 2012 Lincoln MKZ has your number. To its credit, the Lincoln MKZ offers a competent drivetrain with its gasoline V6 and class-leading efficiency with its Hybrid. If you believe the design and construction of a luxury car begins with its platform, the Ford Fusion-based 2012 Lincoln MKZ may not be for you. There has been little more than tweaking for the 2012 model of the Lincoln MKZ, a reliable indicator that an all-new MKZ sedan is just over the horizon. In the interim, numerous premium features have been made standard, such as heated and cooled seats. And, as with most Ford passenger vehicles, there remains a huge emphasis on in-car technology, such as SYNC Applink. Finally, there are two new metallic colors: Crystal Champagne and Cinnamon. Despite the competence of the 2012 Lincoln MKZ sedan's Ford-Fusion underpinnings, it will likely not be confused with luxury cars that were engineered to that calling from the beginning. We like the V6 powertrain and its performance, and the 2012 MKZ certainly drives with competence and predictability, but other mid-size luxury entrants offer superior driving experiences. It's competent and smooth enough, if not exciting, and more enthusiastic drivers will undoubtedly shop for something else, while those who do test-drive and choose the MKZ will almost certainly find it to be more than just satisfactory. There is one positive note for hybrid enthusiasts, however: The MKZ Hybrid can travel up to 47 miles per hour on the battery alone. The 2012 Lincoln MKZ is a leader in its adaptation of a hybrid drivetrain to near-luxury architecture. And the result is compelling, with 191 total system horsepower and an EPA city fuel-economy rating of 41 miles per gallon. An all-aluminum, DOHC V6 producing 263 horsepower while running on 87 octane gasoline is a beautiful thing, and Lincoln offers it. When connected to the standard-equipment 6-speed automatic, the V6 delivers competitive fuel economy, with an EPA city rating of 18 and highway rating of 27. Inside the ultra-quiet, premium-quality cabin are generous portions of real wood, aluminum-look trim and chrome accents. Rear-seat space is surprisingly generous, with more than three feet of legroom. The trunk is a best-in-class 15.8 cubic feet, with a flat floor and low lift-over height for easy access, and the compact decklid hinges won't crush or interfere with your cargo. The class-exclusive standard 60/40-split rear seats fold flat, with a convenient pop-down spring assist, for easy storage access or to extend the cargo floor straight through from rear deck to front seats. To its credit, Lincoln's design team has done a credible job in crafting a Lincoln "look" onto the platform the MKZ shares with the Ford Fusion. The front end does not lack for chrome and the prominent Lincoln "waterfall" grille wraps into the headlamps with a distinctive appearance. And, whether you like or don't like chromed alloy wheels, those on the MKZ are rather pleasant. 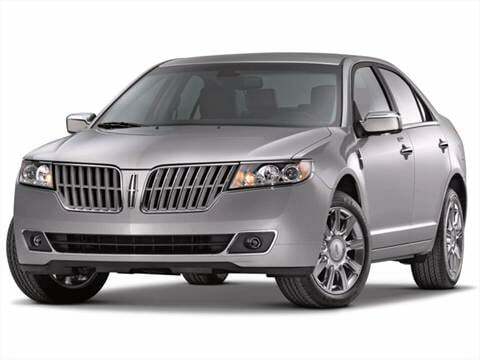 Lincoln's record of reliability is perhaps one of the 2012 MKZ's most notable items of "standard equipment," as J.D. Power has cited the Lincoln MKZ for its very low number of problems per 100 vehicles - and this was out of 35 brands. On the hardware front, Lincoln's product team offers LincolnSYNC, which provides an "omnipresent link to contacts and information." Lincoln's Premium Sound System provides nine speakers and SiriusXM Satellite Radio (and a 6-month subscription). And standard heated and cooled front seats should play well in Alaska, Arizona and, depending upon the time of year, just about anywhere in between. Useful options for the 2012 Lincoln MKZ include the Blind Spot Information System (BLIS) and a rear-view camera; both are available with Lincoln's optional Navigation Package. And, for those living in places where the weather can be difficult, the MKZ's available all-wheel drive (AWD) is an easy way to enhance all-season safety. Finally, a Sport Appearance Package adds 18-inch wheels and tires, a sport-tuned suspension and numerous interior and exterior appearance enhancements. The MKZ sedan's 3.5-liter DOHC 24-valve aluminum Duratec 3.5-liter V6 delivers 263 horsepower and 249 lb-ft of torque through a smooth-shifting 6-speed automatic transmission. The Duratec V6 boasts variable intake-valve timing, a dual-plenum intake manifold and a relatively-high 10.3:1 compression ratio to optimize its balance of performance and efficiency. The MKZ's hybrid drivetrain combines a 2.5-liter DOHC in-line 4-cylinder with 156 horsepower and 135 lb-ft of torque, matched with an electric motor rated at 106 horsepower. The result is 191 total system horsepower and a city EPA rating of 41 miles per gallon. Notably, both FWD gasoline and FWD Hybrid models of the 2012 Lincoln MKZ have base Manufacturer's Suggest Retail Prices (MSRPs) of roughly $35,000. Adding all-wheel drive - which isn't available on the hybrid model - will cost just under $2,000. To its credit, Lincoln provides a lengthy list of standard equipment for the MKZ, so necessary options are relatively few. We "built" an all-wheel drive 2012 Lincoln MKZ online and were "out the door" for under $40,000, plus taxes, title and license fees and not including any negotiation in the purchase price. Be sure and check the Kelley Blue Book Fair Purchase Price to see what others in your area are paying for the 2012 MKZ. As equipped, the window sticker is in line with the Lexus ES 350, Cadillac CTS and Chrysler's 300C. If you consider, however, the real cost of ownership as including the effects of the trade-in value, the Lincoln will fall short of its direct domestic competition, and will be even further short of models from Acura, Audi or Infiniti. This is a great car that is reliable and easy to drive. I will likely buy another one if this one ever starts to cause problems. AWD... Holy cow, what an amazing value! This car is just perfect! The ones equipped with AWD are amazing in snow. Bought this at Varsity Lincoln. Great Experience! Certified pre owned.